Will the Trade War Derail the Longest Bull Market in History? Copper, European banks, and emerging markets all entered into bear market territory last week and the trillion dollar question strategists are asking is whether US markets are likely to get pulled down as well, especially with fears that a full-blown trade war may crash the global economy. With this now being the longest bull market in US history as of Wednesday, August 22, we take a look at financial conditions, the yield curve, jobless claims, and our Fed funds risk neutral index to see whether the bullish primary trend in the US stock market and economy is in danger of coming to an end. In our Big Picture segment from earlier this month, No Recession or Bear Market, But Plenty of Turbulence, Jim Puplava warned that problems overseas would likely cause some market volatility but argued that an imminent recession or bear market in the US was unlikely. When it comes to gauging the risk of a stock market top and the possibility of an imminent recession, one way to do this is by looking at the level of stress in the financial system via interbank lending rates, yield spreads, return correlations, stock market volatility, and other measures. 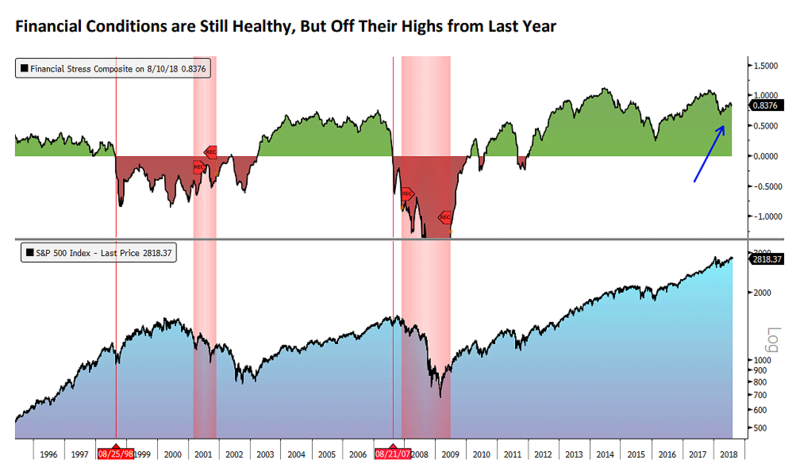 As we discussed on FS Insider last week, financial stress levels in the US are still quite low and are not raising a red flag, something that usually precedes major turning points in the market. As you can see in the chart above, financial stress levels moved into the red zone as problems in Asia and Russia spread to Long Term Capital Management in the late '90s and then again at the peak of the market in 2007. Currently, however, financial stress conditions are quite healthy and, without a sudden decline, are supportive for the market outlook. What About an Inverted Yield Curve? An inversion in the yield curve takes place when yields on shorter-maturity bonds, in this case 2-year treasuries, move higher than yields on longer-maturity bonds, i.e. 10-year or longer (for more info on the yield curve, click here). The yield curve is widely discussed in the financial press—especially lately since we are about 24 basis points or 0.24% away from moving into inversion territory—and Fed President Bostic even said recently that he would not make any monetary policy decisions that would knowingly invert the yield curve since that would essentially mean the Fed is pushing the economy into a recession. The problem is, the yield curve has often inverted numerous times before a recession finally hit and, in some cases, marked the beginning of a major advance in the stock market before a final peak took place. 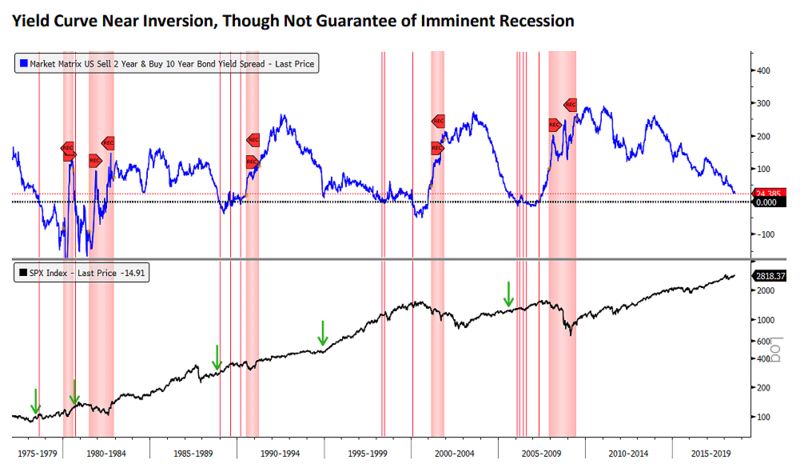 In the chart below, points where the yield curve has inverted are shown with red vertical lines, recessions as red vertical bars, and the green arrows indicate where the S&P 500 was when the yield curve was at the same level of today, i.e. 24 basis points. Given where we are currently, looking over the past four decades, on average a recession hasn't occurred from this point until about two and a half years in the future. This timeline has varied widely however from cycle to cycle but, generally speaking, the yield curve is not flashing an imminent warning sign when it comes to a US recession or recessionary-led bear market in US stocks. Jobless claims are reported weekly and count the number of people filing for unemployment. They are considered one of the most important leading economic indicators because they begin to spike prior to every recession going back at least to the 1960s, as you can see below. 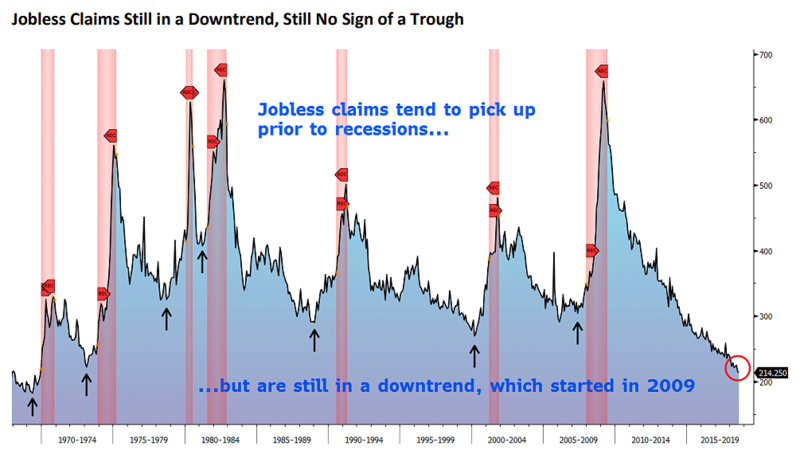 If we assume that jobless claims are at the lowest they will reach this cycle, and that they're going to now spike higher from these levels, on average a recession would take place in about 10 and a half months from this point, taking us into June of 2019. For now, however, it does not look as if the job market is facing imminent danger because small businesses—one of the leading job creators in the US—are very positive on the economic outlook, meaning they are likely to retain the millions of workers they currently employ...or even continue their pace of hirings. 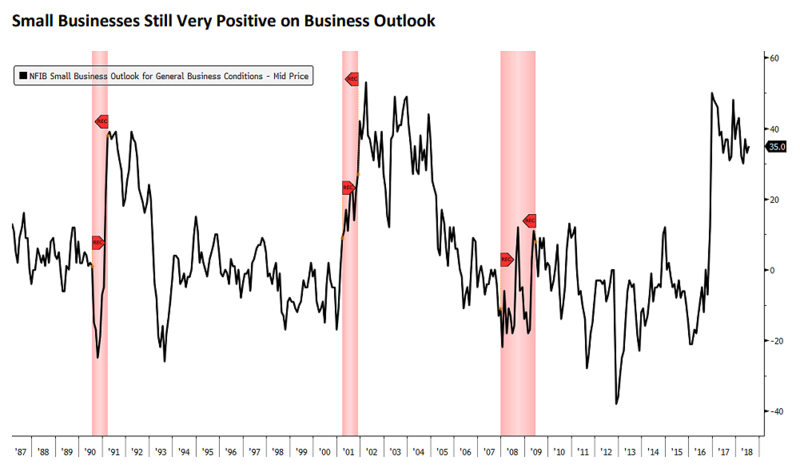 As you can see from the chart, the current level of small business optimism is actually much closer to levels seen right after the economy has emerged from a recession (i.e. early in the cycle) vs. one that is about to fall into recession (late in the cycle). This is probably one of the more economically bullish charts or data points out there. Is the Fed About to "Break the Market"? The Federal Reserve is slated to continue raising interest rates and many believe this is going to eventually break the bull market. 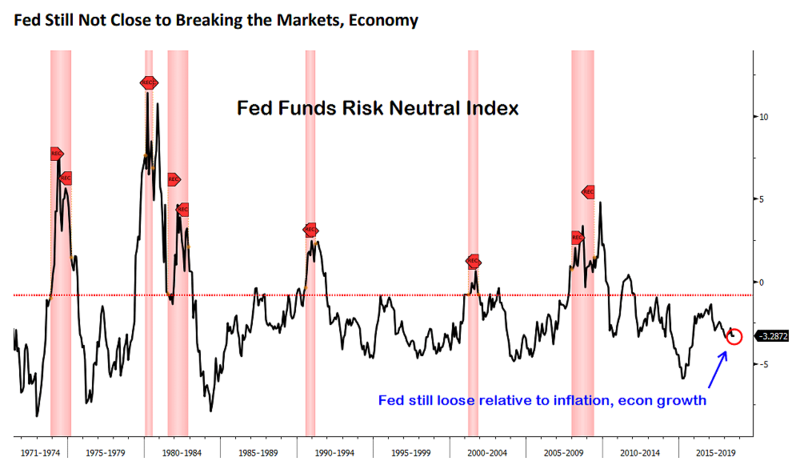 Chris Puplava at Financial Sense Wealth Management has developed a Fed funds risk neutral index (see below) to help gauge this risk by comparing the Fed funds rate to the level of inflation and economic growth. Currently, this indicator reveals that Fed policy is still on the loose side and isn’t so tight as to endanger the economy or the markets. As you can see, this chart has spiked—signifying Fed tightness in the face of slowing economic growth and inflationary pressures—prior to recessions. Given the likelihood for increasing inflationary pressures in 2019, barring a pause in Fed rate hikes, we suspect that the Fed funds risk neutral index may begin to tighten from current levels. That being said, if the US can remain decoupled from international turbulence and the indicators above remain supportive, this could propel further capital into US stocks as a safe haven. With regards to escalating tariffs and a full-blown trade war, though we expect this will have a negative impact on the global economy, China has the most to lose since the US is far more insulated due to its highly diversified economy and large current account deficit. Listen to this full broadcast by clicking here. For more information about Financial Sense® Wealth Management and our current investment strategies, click here. For a free trial to our FS Insider podcast, click here.